Nexdim Empire » Blog Archive » South Africa 2010:RIGOBERT SONG AND NJITAP SELECTED ? South Africa 2010:RIGOBERT SONG AND NJITAP SELECTED ? 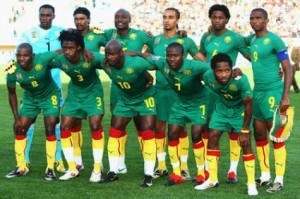 List of 30 shortlisted Cameroonian players by Paul Le Guen for preparative training for the World South Africa. WHY IS RIGOBERT SONG AND GEREMI NJITAP IN THIS SQUAD????? Bedimo, Binya, Alo Efoulou and Bikey are not part of this squad. On the return of some names, including Song and Njitap, strong rumours are suggesting that there was pressure from the highest authorities of Cameroon.Paul Le Guen claims he had always maintained that “those two still had their chance with Lions. Its a good call but as we all know, the fathers are still going to be in the last 23 man sguad, i wonder what they will be doing in the team that they did not do during the nations cup. Paul Le Guen; You are under pressure, you all have always been under pressure. Just serve your time, eat your part of our money and leave.